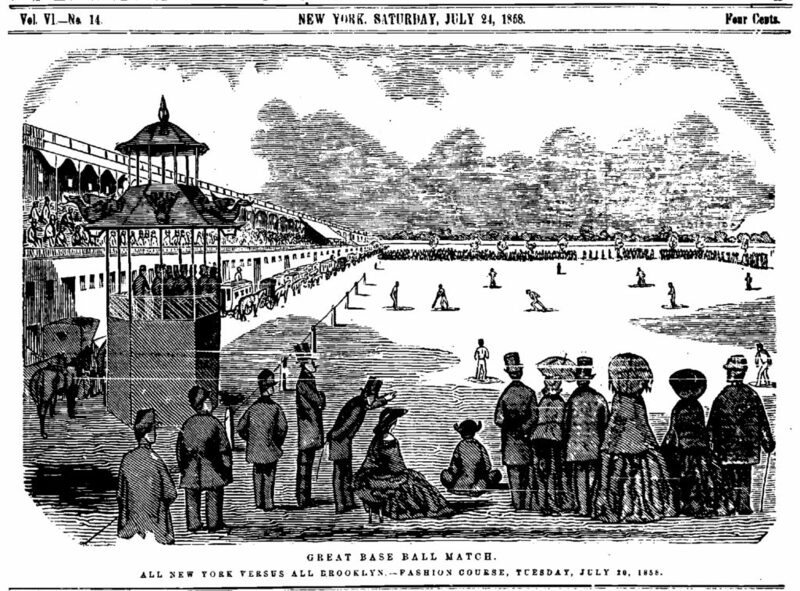 160 years ago today, Brooklyn won easily defeated New York 29-8 in the 2nd game of the 1st All-Star Game series known as the Fashion Race Course Games. The underdog New York team had won the 1st game 22-18 on July 20, 1858. The victory set up the deciding game on September 10, 1858 in which Doc Adams be the umpire. The Fashion Race Course games were a series of 3 games played between All-Star teams (pick nines) comprised of the finest New York-area players versus the finest Brooklyn area players in the 1st real All-Star Games. It was also the 1st time admission was charged to watch a game. The games were played at the Fashion Race Course grounds which were located about a mile and a half from where Citi Field stands today. For more on the series, read “History Buried: America’s All-Star Game of 1858” by John Thorn, Official Historian of MLB.